Flights • Twice-a-week nonstop service to Los Angeles International Airport begins Sept. 26. File photo | The Associated Press Allegiant Air is adding a third destination from Provo Municipal Airport with a twice-a-week nonstop jet service to Los Angeles International Airport, starting Sept. 26. 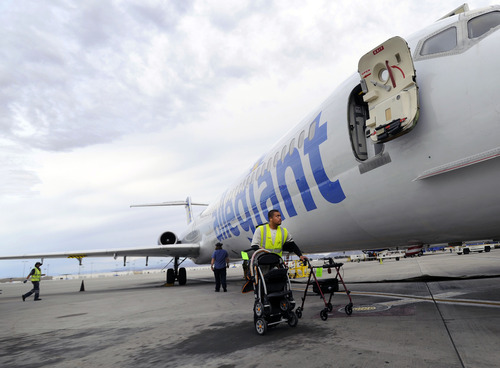 Allegiant Air is adding a third destination from Provo Municipal Airport. The quirky low-cost, high-fee airline based in Las Vegas will begin twice-a-week nonstop jet service to Los Angeles International Airport on Sept. 26, with introductory $54.99 one-way introductory fares. Allegiant will fly the route on Thursdays and Sundays, but the days may change in the future, spokeswoman Jessica Wheeler said Friday. The airline will use Airbus A319, A320, or McDonnell Douglas MD-80 aircraft on the route, Wheeler said. Allegiant began offering nonstop flights between Provo and Phoenix-Mesa Gateway Airport in Arizona last year. Last month, Allegiant started service between Provo and Oakland International Airport in California. "We are grateful for the amazing partnership we enjoy with Allegiant," Provo Mayor John Curtis said. Wheeler held out the possibility that Allegiant may add more destinations. "We&apos;ve been really happy with all of our service from Provo so far (and) will continue to look at it for other destinations,"she said.